You can’t say you have done shopping in Melbourne if you have not been to Myer. And No, I am not saying that hyperbolically or making any exaggerated statement. Strategically located at the most central part of the town, Myer is one of the largest department stores in Melbourne, housing both affordable and upscale brands, from casual Hush Puppies footwear, luxurious Hugo Boss watches, Australian Aesop skincare products, to British high fashion Jimmy Choo fragrances. But what intrigued me the most are not those dainty European cakes at its 3rd floor Brunetti café, nor the occasional clearance sale that gives the feverish shopper’s adrenaline a rush. It is the humble origin of Myer and its founder that made me pause and appreciate the beauty of Melbourne, and those classic tales of migrant success occurred in this relatively young city at the Southern Hemisphere. The story of Sidney Myer, the founder of the Australia’s largest chain of department stores, is one of the most inspiring success stories amongst all. A Jew and a Russian migrant, Simcha Myer Baevsk (as he was originally known) emigrated to Melbourne when he was 21-year-old, following the footsteps of his elder brother Elcon Myer. Penniless and with little knowledge of English, the Myer brothers commenced their humble working life in an underclothing factory at Flinders Lane, Melbourne. Myer then moved on to be a door-to-door salesman, pushing cart of products across the town, persuading traditional homemakers and modern fashionistas to give a chance to his exquisite laces and elegant stockings. Shortly a year later in 1900, Myer took the bold step and established the first Myer store, a drapery store in Bendigo. The business turned out to be a thriving success, thanks to Myer’s natural talent as a salesman and his innovative way of marketing. Myer designed and created visually enticing in-store displays, and fully utilized his advertising prowess to capture the loyalty of his female patrons. The business boomed, and within a short few years, a Myer at Bourke Street Mall began its business and quickly became the icon of Melbourne’s fashion and style. It is undeniable that Myer was an exceptionally gifted and visionary entrepreneur. But Myer was more than just that. He was a true leader, a person of strong moral fortitude who received great respect and admiration from his employees. The Australian Great Depression in 1930s saw the sudden surge of unemployment and severe economic downturn. Myer retrenched not a single of his employee. All staff, including himself, suffered pay cuts. For the unemployed and homeless, Myer financed a Christmas banquet for 10,000 at the Royal Exhibition Building, gave a present to each child, and personally waited on his guests. The Melbourne University, Children’s Hospital, Melbourne Symphony Orchestra and the Shrine of Remembrance (just to name a few) are beneficiaries of Myer’s charity and philanthropy efforts. Sidney Myer died suddenly at the age of 56 in 1934. He left a fortune of around $1 million (a very large sum of money at that time), one-tenth of which was directed to a charitable trust to exist in perpetuity- the Sidney Myer Fund. The Myer store today remains a great place to shop. 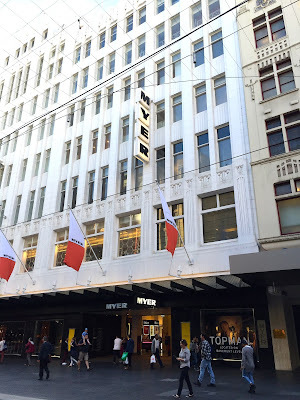 However, being a public listed company and a shareholder-driven commercial enterprise, the Myer store slowly loses the personal touch a family business could offer under the leadership of the man Sidney Myer. Yet Myer will forever mean more than just a name of a department store; it is a symbol of hope to the foreign migrants, a constant reminder of what the true Melbourne can offer to every hopeful soul with big dreams.